The ASN Filter Designer is a powerful real-time DSP experimentation platform that cuts your development costs by up to 75%! How do I design a filter that meets my requirements? How can I verify my designed filter on test data? So what is the big deal with industry standard tooling? Interactively design, validate and deploy your digital filter within minutes rather than hours. No need to explicitly define technical specifications. Before you begin designing, just draw and fine-tune your requirements in real-time. Validate and let the tool fill in the exact details for you. Import your own datasets or use the inbuilt signal generator to generate test signals. Validate your filter performance in real-time via the advanced signal analyser. Experiment in real-time with specialised symbolic mathematical expressions with ASN FilterScript. Export any designed filters to industry standard software frameworks for your smart sensor application. 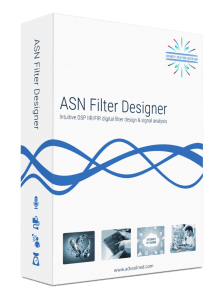 The ASN filter designer provides everything required in order to design, experiment, implement and then evaluate complex IIR and FIR digital filter designs for all IoT/IIoT smart sensor applications. For engineers, lecturers, researchers, students and hobbyists. Abandon the traditional design paradigm of manually inputting parameters into text boxes. Instead, just click on a design button and wait a few seconds for the result. Find out how our real-time design paradigm leads to a signficant cut in development time. In some cases up to 75%!